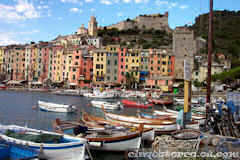 Portovenere is a medieval fishing village situated just south of the Cinque Terre on the Italian Riviera. This charming village is well worth the visit and can be reached from the Cinque Terre by boat or from La Spezia by boat or by bus from the train station. Portovenere, on the Gulf of Poets, is a UNESCO World Heritage site. Its picturesque harbor is lined with brightly colored houses while narrow medieval streets lined with shops lead up the hill from the ancient city gate to the castle. The tip of the promontory holds a picturesque church. Byron's Cave is a rocky area leading to the sea where the poet Byron used to swim. Ferries cruise along the coast each day, offering passengers a chance to have a view of one of the most evocative landscapes of the Mediterranean. It is possible to visit the three nearby islands by boat; Palmaria, Tino and Tinetto. If you want to do some hiking in the Cinque Terre, take the ferry from Portovenere to Vernazza and hike from there to Monterosso, where you can catch the ferry back to Portovenere. There is also a trail to the Cinque Terre from Portovenere and the walk takes about 5 hours. 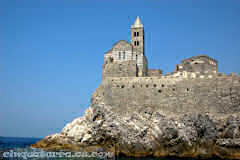 • The Church of San Pietro sits on a rocky promontory overlooking the sea. It was built in 1277 in the typical Genovese Gothic style. • La Grotta di Byron (Byron's Cave) from which Byron famously swam to visit his friends in Lerici on the other side of the gulf. • The Doria Castle with its powerful structure representing a wonderful model of Genoan military architecture. The castle was first built in 1161, but it was significantly reconstructed in 1458.